Planning your wedding is a daunting task. I know, because I’ve done it myself and can clearly remember how overwhelming it all felt! And deciding on the right photographer is particularly important, as we want to ensure the memories of that day are captured as beautifully as possible. I treat each wedding with the respect it deserves; we are all individuals with our own unique story and it is so important to me to present you with images that will live forever, that fill you with joy every time you look at them. I hope the information below gives you a good idea of what to expect when you book me as your wedding photographer, and if you like how everything sounds drop me a line at siobhan@siobhanhphotography.com and we can chat some more. What is your style and approach to a wedding? I am definitely a story-teller, and I will capture your day from start to finish in a very natural documentary style, with a stylish, editorial edge. I won’t be making any big demands for elaborate poses, but instead I will be emotionally-involved (I can’t help this!) which allows me to feel each moment authentically and know exactly when to hit that shutter. I will always work quietly in the background, allowing you to enjoy each part of the day as you should, and I want you to think of me as a friend; a calming influence with a smile on her face who has your back at all times. I will take you both out for a short walk after the ceremony where you can enjoy the moment with your new husband or wife, and capture some of that beautiful, natural emotion as it unfolds. My couples always feel very comfortable and relaxed in my company, they have already done an engagement session with me, so they know it’s not as daunting as they had perhaps first thought. I usually ask for no more than 30 minutes for the couple portraits, and if we have time later on, it’s always nice to pop out for ten minutes to capture some more lovely portraits as the sun goes down. Of course. It is rare that entire families get together so these images are really important for most couples. I generally advise people to keep them a minimum (no more than 5-8 groups) as they tend to take longer to organise than you might imagine, which in turn means less time for the bride and groom session and candid guest shots. I will ask you to nominate one or two members of the bridal party to help me gather the right people for each shot which will help avoid any delays. How much of the day do you cover? I will arrive when the bride is getting ready (one of my favourite parts of the day) where I will photograph all of the little details (dress, shoes, jewellery, invitations, etc), your hair and make-up being done, and all of the moments with your bridal party in between. I usually leave for the ceremony around 30 minutes before the bride, which allows me time to get some shots of the groom with his party, as well as the guests arriving , any interesting details and the general buzz in the air. After the ceremony, I will photograph the guests mingling and having fun at the cocktail reception, cover the formal group shots and take you both out for some pictures. My day usually finishes around 30 minutes after the first dance, but this depends on what you have planned and I can stay longer if you like. It’s great to get the fun dance floor shots when everyone is a bit more footloose! Side note: if you would like groom prep covered, or if you are having over 100 guests, it is really worth considering booking a second shooter on the day. It’s not possible for me to be in two places at one time, so as part of my service, I can book one for you. I work with a number of excellent photographers whose style complements mine, and who will give you the additional photo coverage you might need. Tell me about your engagement sessions. One of the most important things to me is that you feel really comfortable in front of the camera and that is the main reason I include a pre-wedding shoot. I really don’t want you to feel any awkwardness on your wedding day (in any way) and I get that it is daunting having a camera watching you all day! Once you have spent an hour or so hanging out with me and my camera, you will realise I’m not one of those scary photographers at all: I am really relaxed, friendly and I love getting to know more about you both! We would normally agree on a nice location, somewhere convenient for both parties, and it’s nice to choose a place that has meaning to you both. The shoot takes around an hour, and I will take a nice variety of shots in that time. You will receive the high res digital files a few weeks later, which you can then incorporate into your wedding day if you wish. I love when they are used in a signing book when the guests can view them as they write lovely notes to you, and at the end of the wedding, you have a beautiful heirloom to cherish. Rest assured, if it rains, you will still get really beautiful pictures of your day! I am very experienced and have been working as a photographer for a long time, so it just means taking a slightly different approach to things. And anyway, I’m Irish, so rain does not bother me in the slightest! I’m definitely a quality over quantity person; I would much rather provide you with 350-600 images that I am proud of, and that truly tell the story of your day, than overwhelm you with a ridiculous amount that are repetitive or inferior in quality. The exact number really depends on what you have planned for the day, and how long the day will be. We can chat about this in more detail when we meet for a consultation. When and how do we see our final images? After your wedding, I will send you a preview selection of images within two weeks, which I will also post to my Facebook page where your guest can view them too. The images are carefully hand-edited so the full selection of images can take up to six weeks to be delivered, depending on how busy my wedding season is. The images will be uploaded to a private, online gallery which you can share with family and friends, mark your favourites, download in print or web sizes and even order prints if you wish. You will then receive your beautifully-presented USB box by first class post. Yes, I am fully insured for public liability and professional indemnity and all of my professional camera equipment is insured too. I will be working very hard from the beginning of the day until the evening, with no time for food or drink, so yes, I would really appreciate a meal! You can arrange a meal for me which I can eat by the bar, while everyone is sitting down to the wedding breakfast. No one wants to be photographed with a mouthful for food anyway, so I will use this time to re-fuel, prep my cards and batteries and boost my energy levels for the next part of the celebration. I have a degree in photography from Dublin Institute of Photography (D.I.T), which is considered the leading photography course in Ireland. Aside from this, I have also completed courses in Photoshop and Editing Techniques whilst living in Montreal and I have even worked as a photography lecturer in Dublin. I am a member of the Society of Wedding and Portrait Photographers, which is the foremost industry association here in the UK, and as such, I abide by their professional rules and codes of conduct. I am also a recipient of one of their coveted international Gold Awards for my photography work. Do you travel/charge for travel? 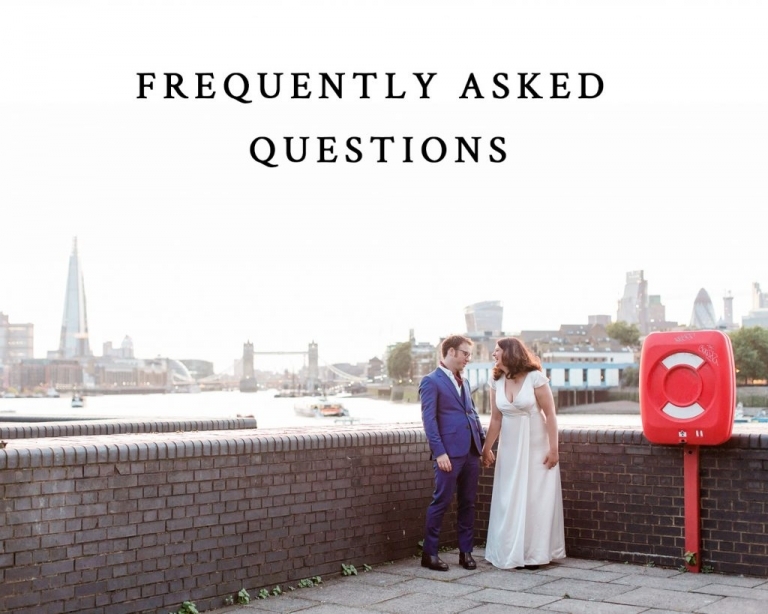 I mostly cover weddings in London and Surrey, but I am happy to travel within a 100 mile radius to cover your wedding without any additional charge. If you are getting married in Ireland, get in touch for a quote as I may be able to tie it in with a trip home to see my family. I love a good Irish wedding! That all sounds great. How do I book and pay? If you are happy that I am the right photographer for you, or if you would like to meet up for a no-obligation chat before booking, please email me at siobhan@siobhanhphotography.com and I will send you my brochure and check my availability. If I am available and you’d like to proceed with the booking, you will need to sign and return my e-contract and pay a booking deposit of £300 to secure the date. Absolutely. I can design and create a beautiful heirloom album for you. I work with one of the finest creators of handcrafted albums in the world, Folio Albums, who are based right here in England. You will have different options for cover materials and number of spreads, etc but as a guideline, a beautiful leather-bound contemporary style 30-page 10×10″ album is available for £600. You can also order smaller duplicate versions which make fantastic gifts for parents. Who owns the copyright to the wedding photographs, can I print my own? The copyright of the images always belongs to the photographer, however you are entitled to share and print the images as much as you like as long as it is for personal use. If you would like to use them commercially, we will need to discuss this first. If you have friends or family who would like to order prints from the day, feel free to send them the digital files, or they can order them directly from your gallery which makes it easier for you.